Live shows for pre-schoolers: what’s coming up? Live theatre with children can be really special. You might think your little ones won’t sit through a whole show but they might just surprise you. Most live shows aimed at pre-schoolers are around an hour in length as lots of production teams understand that pre-schoolers just won’t sit still for that long. The other thing is that most have great opportunities for audience participation as well, so they don’t actually have to sit still all the time, dancing in the isles is positively encouraged! There are loads of shows out there, some better than others, but here is what’s coming up. This new tour opened at the Churchill Theatre, Bromley 27 January and visits 51 theatres across Ireland and the UK booking through till summer 2017. Richard Lewis has adapted the TV animation for the stage and also directs. He also adapted and directed the five highly popular Peppa Pig theatre tours (four of which had sell-out West End Christmas), two LazyTown Live! tours (2007 – 2009) and Octonauts and the Deep Sea Volcano Adventure (2014 – 2015). The composer is the highly talented Mani Svavarsson who has composed the music for a number of FieryLight shows including LazyTown Live!, Octonauts and the Deep Sea Volcano Adventure and all of the live Peppa Pig shows. Mr Bloom, as seen on CBeebies, is hitting the road on his first ever live UK theatre tour in 2017 and is visiting Liverpool Empire and Manchester Palace Theatre. ‘Tiddlers’ of all ages are invited to come and see their favourite gardener and his veggie friends in their brand-new stage version of Mr Bloom’s Nursery. 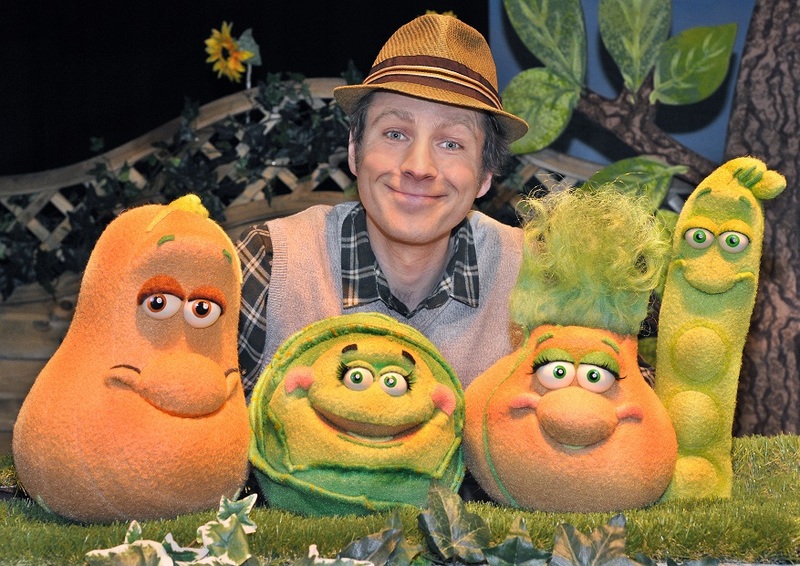 As well as featuring Mr Bloom himself (Ben Faulks) the show will also star Colin the Runner Bean, Margaret the Cabbage, Joan the Fennel, Raymond the Butternut Squash, Sebastian the Aubergine and the Wee McGregors, not forgetting Mr Bloom’s trusty Compostarium too. Mr Bloom and his Veggies are getting ready for a very special occasion – a member of the Royal family is paying them visit. Can you lend a hand and help them get the Allotment ready in time? They certainly hope so! Come and sing along to all your favourite songs: ‘This Is My Allotment’, ‘Meet The Veggies, ‘The Compo Song’ and’ Night Night Veggies’. Using song, play and interaction Mr Bloom’s Nursery is a fun and inspiring show with strong educational values which will entertain parents and Tiddlers alike. North West performances are 29th March 2017 at Liverpool Empire and 17th April 2017 at Manchester Palace Theatre, overall the show will visit over 40 venues nationwide until 30th April 2017. Mr Bloom needs no introduction to children under the age of seven. Since 2011 he has appeared regularly on BBC’s pre-school TV channel CBeebies. The character evolved from an original concept created by Ben Faulks called the Vegetable Nannies, an innovative piece of street theatre consisting of real fresh vegetables being dressed in nappies and looked after by their friendly gardener! The BBC picked up the idea, and the first episode of Mr Bloom’s Nursery was transmitted in 2011 – the show was an instant success. Since then there have been five further series, establishing Mr Bloom as a popular CBeebies character. This live version of Mr Bloom’s Nursery is being produced by Munchkin Entertainment, a brand new theatrical production company. 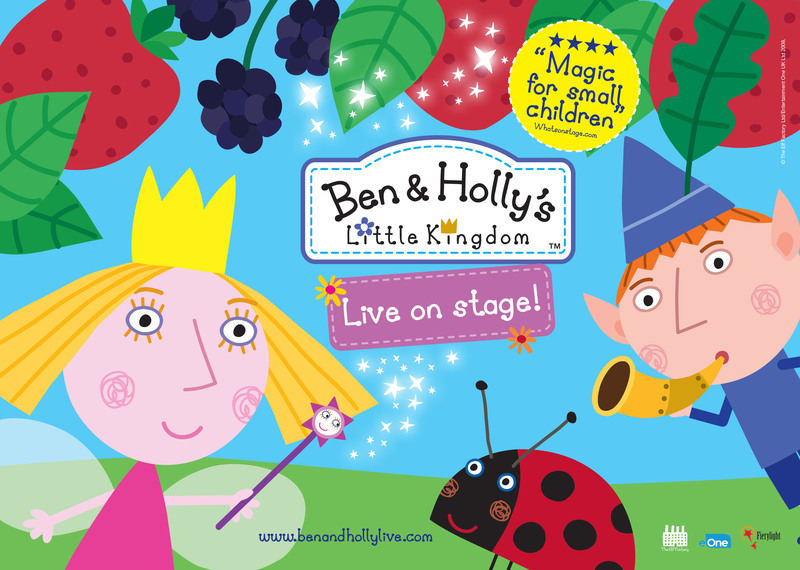 We are big fans of this live show, truly some of the best pre-school theatre I have ever seen. To date over 800,000 people have seen IN THE NIGHT GARDEN LIVE, the world’s only live production of the CBeebies top-rated show. 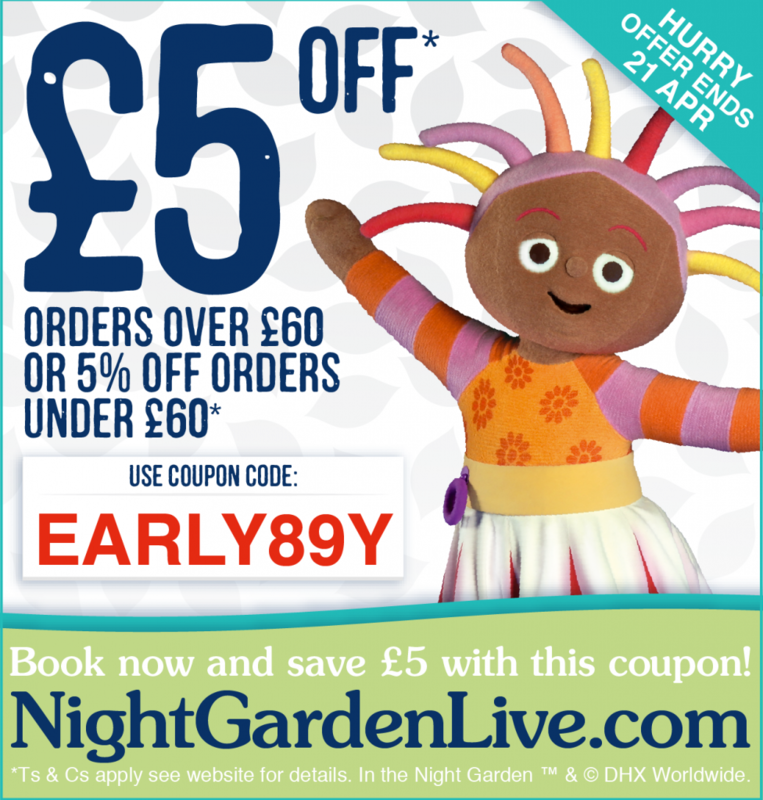 96% of parents would recommend it, according to 2016 audience surveys, and they give an average of 4.8 out of 5 stars in 8,766 parents’ reviews on www.NightGardenLive.com. 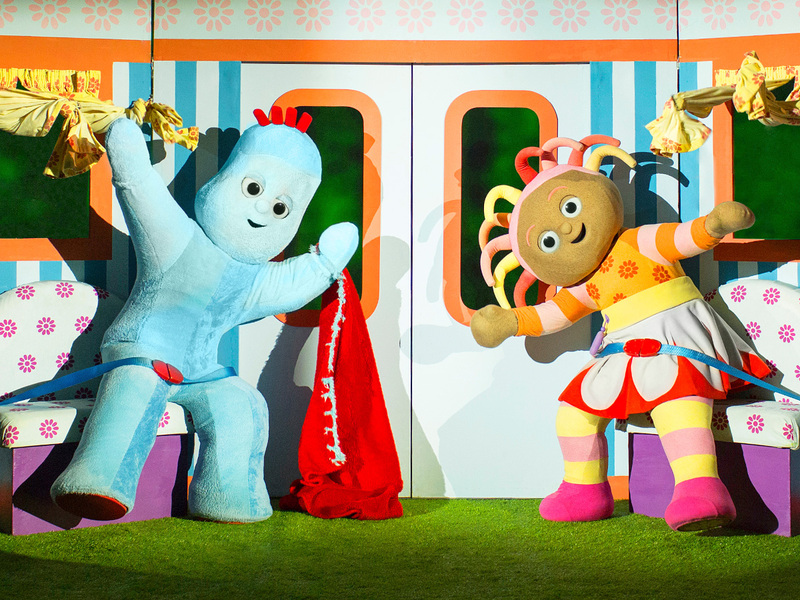 The delightful children’s classic returns for its eighth consecutive summer tour, which also coincides with In the Night Garden’s 10th anniversary celebrations. TICKETS ON SALE NOW and we have a discount code for you to use below. What pre-school theatre have you seen with your children? Any recommendations?